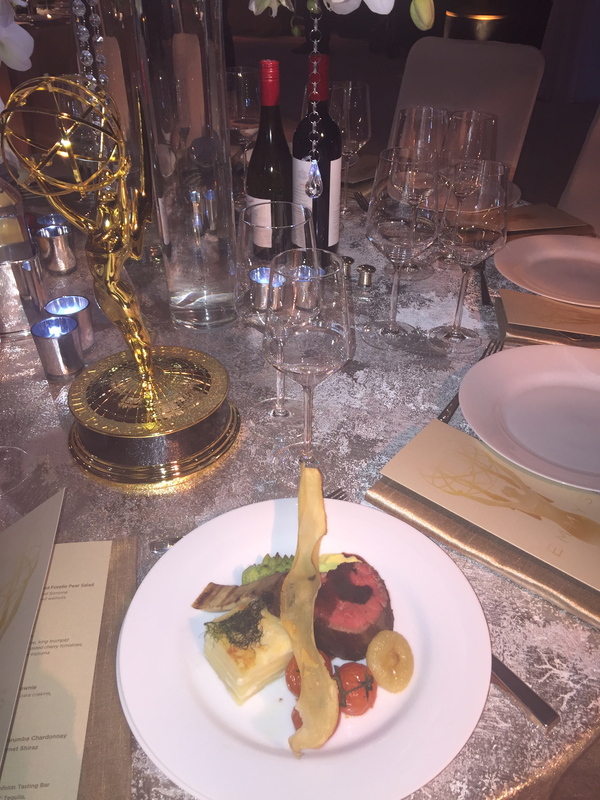 The largest formal sit-down dinner is on September 20 at the Los Angeles Convention Center following this year’s Emmy Awards show. As the 4,000 nominees and winners walk inside the beautifully transformed ballroom, they will be handed a flute of Ferrari Brut NV TrentoDOC Metodo Classico. The Governors Ball is known for its dramatic elegance, and this year’s theme, “Reigning with Radiance” is spectacular with subtle shimmering hues and rich vibrant textures. It’s classic grandeur in a comfortable and relaxed atmosphere. Sequoia Productions has designed the exquisite party at the helm of the talented Cheryl Cecchetto. This is the 18th year, Cecchetto and her team have worked their magic. This year they assembled 30 sparkling Swarovski crystal chandeliers that are 27-feet tall and drop down to the center of the tables. Over 45,000 Swarovski crystals were used to create 536 crystal strands. The lavish table settings include linens with colors of rose gold, ivory, silver, amber blush, and champagne. There are 12,000 pieces of china, 11,400 wine glasses and 4,000 champagne flutes. The Governors Ball has 400 floral arrangements on the tables and around the room featuring white roses, calla lilies, white cascading orchid stems and 2,500 flickering candles arranged by Kevin Lee of LA Premier and his talented team. 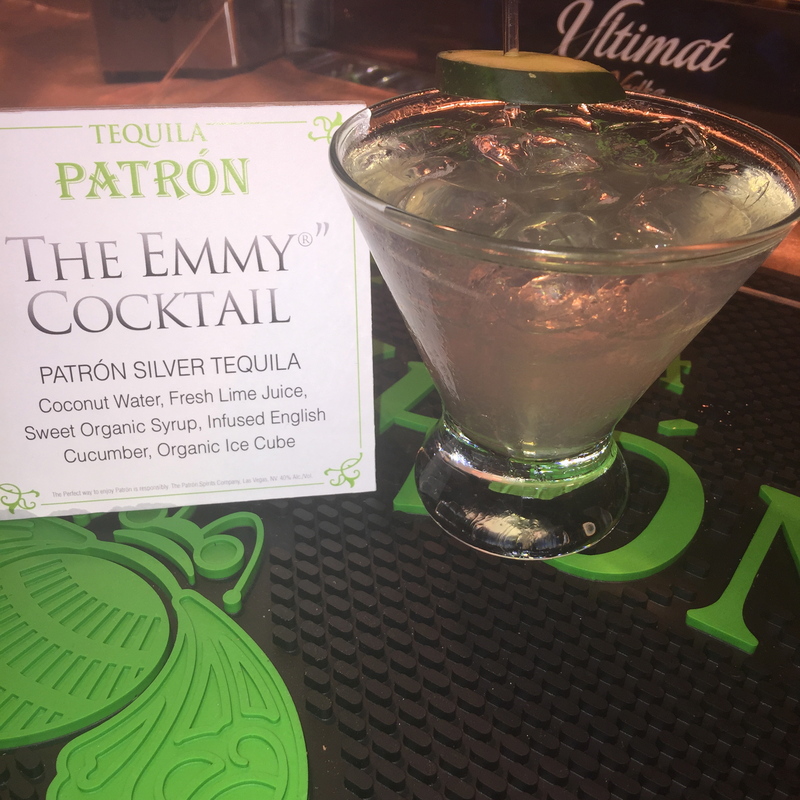 After sipping the Emmy Cocktail made with Tequila Patron by mixologist David Alan and his team from the Patron Spirits Company, Emmy guests will be led to their tables for a splendid three-course Patina Group sit-down dinner. Servers will deliver a wildflower honey poached forelle pear salad with lavender and fennel-scented Sonoma goat cheese, with fresh sliced figs, spiced walnuts and quince with a quince vinaigrette. It’s paired with a glass of Penfolds Bin 311 Tumbarumba Chardonnay. Next, guests will be served a plate with filet of beef tenderloin with a red jus and béarnaise espuma. It is accompanied with a slice of herb-scented potato terrine, King trumpet mushrooms, yucca chips and roasted cherry tomatoes. 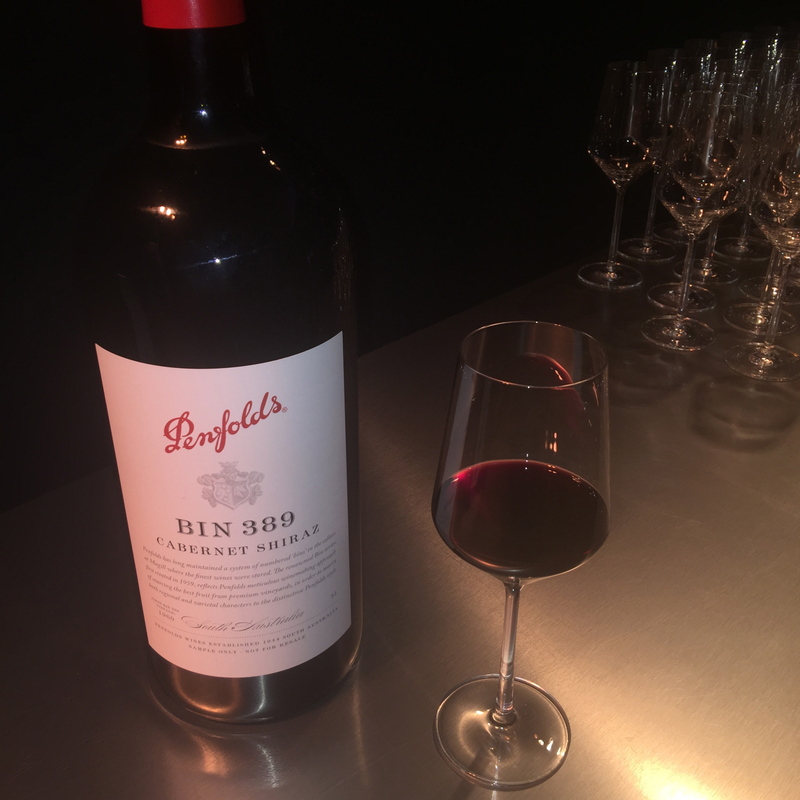 Servers pour glasses of Penfolds Bin 389 Cabernet Shiraz to pair with the filet. The Ambassador of Penfolds wine, DLynn Proctor, will give each winner a personalized gift bottle on Penfolds wine in a black wooden box to take home and enjoy. 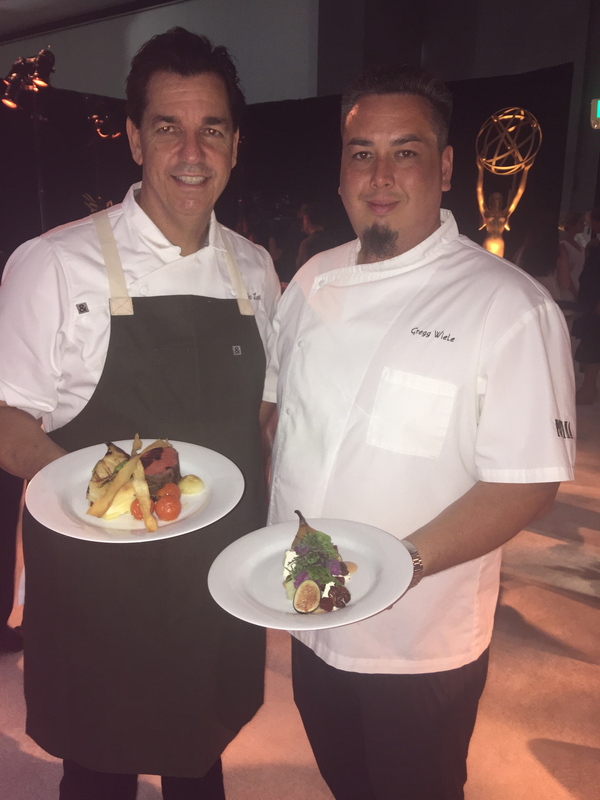 The exquisite menu was created by esteemed chef and founder of the Patina Restaurant Group, Joachim Splichal, along with Chef Gregg Wiele the West Coast Culinary Director of Patina Restaurant Group and Alec Lestr Executive Chef of Patina Catering. It’s the 20th year that this catering team has created a one-of-a kind menu and cooking production team with 18 executive chefs and 205 on-site cooks to prepare 4,000 dishes. Dessert is a single origin Ghana brownie with Zephyr popcorn chantilly, cara crakine and baby bourbon caramel. It was created by the talented Patina Pastry Chef Frania Mendivil. Pots of tea and Groundwork Coffee Co. coffee will be poured at each table. Throughout the evening guests can sip on Natural Artesian Water presented by FIJI Water. For winners seeking more chocolate, there will be chocolate stations with over 1,000 pounds of Cellar Door Chocolates. Each station will offer a variety of of nine different chocolates for people to taste throughout the night. This is the second year that Cellar Door Chocolates owner Erika Chavez-Graziano has offered her Kentucky chocolates to the ultimate Emmy party. Throughout the evening live entertainment will set the mood. The Headliner for the evening is International superstar Andrea Bocelli and 16 time Grammy Producer David Foster. It is a night no one will ever forget. For those who need a makeup touchup, celebrity makeup artist April Chaney and her team will be on hand with a L’Oreal Paris makeup area to make sure each guest looks their best. Watch the Emmy Awards on September 20 at 8 p.m. ET and 5 p.m. PT.